If you have a multilingual e-commerce website, you might want to ask yourself one question just as you integrate the edrone plug-in:What language do I want to speak to my customers? A Multi language campaign (bulk email will be sent according to the customer browser settings). A campaign has been created in one language version. Thus, all store customers will receive the same message. We recommend to enable the edrone plug-in only for the specific store sub-site. For instance, if you create campaigns in Polish, we recommend that you enable the edrone plug-in only for the store.pl sub-site. There is no need to integrate with other sub-sites (like store.de or store.cz). errors in statistics. The currency is not translated (EUR 50=PLN 50). Users are identified by their browser settings. 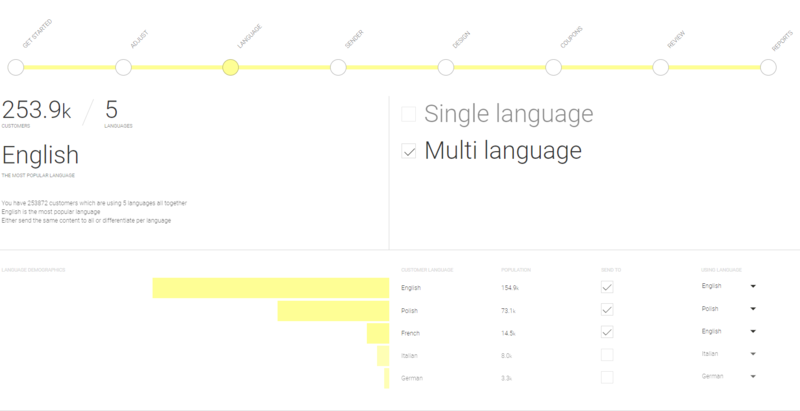 So, if you create campaigns in three different languages, e.g., in German, English and Polish, they will reach customers who use browsers in the targeted languages, respectively. The system offers two options for you to choose what suits you better. Do you want to send multilingual messages but to people who use the same currency?Example: You run a store in English and in German but your prices are all in a single currency: EUR. Make sure that product fields “product_id” uploaded via API have the right prefix for the relevant language version. To ensure correct revenue statistics, you need to create several accounts in the edrone system. Every language version should have a separate app_id.